UK: TAG Energy Solutions has shipped its first four foundations destined for the Humber Gateway offshore wind farm off England's east coast. 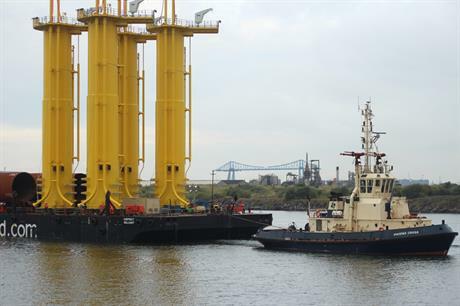 The 60-metre, 650-tonne monopiles were loaded from TAG's site on the River Tees in northern England onto a barge by a self-propelled modular transporter. The transition pieces were then lifted onto the barge by crane. This barge was taken down the river were it met the MPI Discovery jack-up vessel, which is set to install the foundations at the site, 8 kilometres from the Yorkshire coast. TAG said that the remainder of the 16 foundations that it is supplying will be shipped before the end of August. Sif has been contracted to provide the rest of the foundations, some of which have already been installed. The Humber Gateway will consist of 73 Vestas V112-3.0MW turbines and will have a capacity of 219MW. Foundations are set to be put in place imminently, with turbine installation due to start at the end of the year. The E.on-developed project is expected to come online in 2015.